Can anybody identify this vase? Hi, I'm a new member so this is my first post. I'm wondering if anybody can help me identify this vase? Re: Can anybody identify this vase? I have a very similar vase, but unfortunately mine is not marked. However, my search took me to George Ormerod ... if you go on his site you will see that one example of his latest pieces is the same shape. I am not saying that this is his - the mark is too different. But have a look, and perhaps email him a picture and mark to see what he says. Just a thought. Hi Touchdry I've taken a look at George Ormerod's pottery although they're similar I don't think they're his. 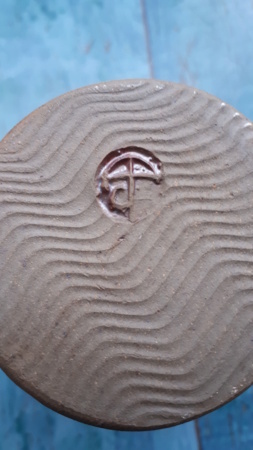 To me the base mark on my vase looks like JT made to look like an umbrella. Due to the wavy lines running across the base of the vase I think NaomiM could be right when she said it could be Dartington pottery. 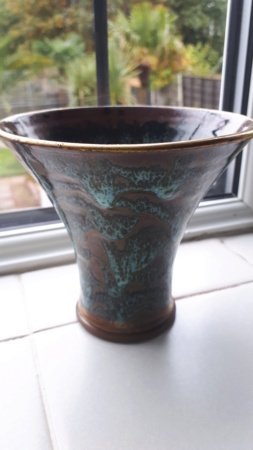 There's a Dartington fish bowl on pinternet with the same wavy lines running across the base and it had a frog potters mark on it.